Dubai, UAE, June 9, 2015: This Ramadan, De’Longhi and Chef Osama have joined forces to celebrate the launch of the new Multifry Multicooker Extra Chef. Merging the art of oil-free, healthy-fried cooking with a multi-functioning cooking appliance, the Extra Chef is the new innovative multicooker that meets every culinary need. A revolutionary cooking appliance, the Extra Chef brings new innovation into the kitchen and inside the world of home cooking, allowing food lovers the option of creating a variety of delicious recipes. From mouth-watering couscous and hearty lamb shank to succulently cooked roast chicken and tender beef shawarmas, the possibilities are endless. Healthy frying and cooking aren’t the only options with the Extra Chef – a range of baking recipes are also easily created, with pizzas, cakes and pies. The technology behind the Multifry Multicooker Extra Chef’s adaptability and versatility lies in De’Longhi’s state-of-the-art Surround Heating System (SHS). This invested knowledge, exclusive to De’Longhi, delivers an exceptional cooking experience to households. The dual heating elements and fan work simultaneously to evenly distribute heat, while the automatic motion of the removable paddle gently mixes a vast combination of ingredients allowing home cooks to serve a variety of perfectly cooked meals in minutes. Last year, De’Longhi introduced the Multifry Multicooker, its range of baseline models in the multicooker range. The Multifry Multicooker Extra Chef marks the launch of its high-end Multicooker, completing the full range available. The Extra Chef model provides equal upper and lower heating power, cooking as a real electric oven with a fan. It also features a digital cooking function control panel. And, for more recipe ideas and cooking suggestions, download the De’Longhi Recipe book from the mobile or iPad play store. Here, food lovers can browse a large variety of traditional and worldwide recipes, in both English and Arabic, featuring ingredients and cooking instructions to prepare the ideal meal. Simply download the app, follow the directions and the Extra Chef will do the rest! De’Longhi has long been trusted by customers to develop some of the world’s finest household appliances, dating as far back as the early 1970’s. Through its distinct design and product engineering, the brand has worked on producing specific features with its products, offering consumers around the world pioneering and practical solutions to meet all their household needs. 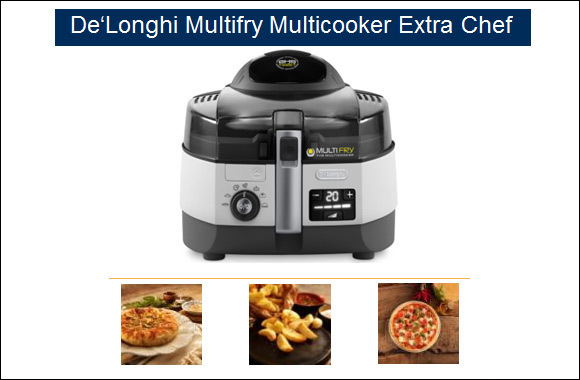 The new Multifry Multicooker Extra Chef is no exception to De’Longhi’s range of leading cooking appliances, delivering the ability to fry without oil, grill, cook and bake – all in one innovative multicooker! The De’Longhi Multifry Multicooker Extra Chef is now available across all leading electronic goods stores and hyper markets across key countries in the Middle East, at a base RRP of AED 899. The automatic motion of the paddle gently mixes food and permits cooking without any need to manually stir food. The exclusive design of the heating elements allows the use of the Extra Chef without the mixing paddle (static cooking), which allows for greater flexibility.